It's Etsy favorites time... a recent bout of insomnia has filled my tank with new Etsy loves! First up is Argyle Whale by Elise Towle Snow. 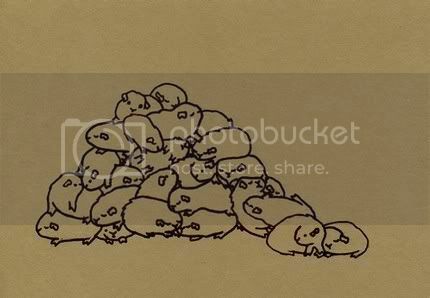 This shop has Gocco prints of bunnies, whales covered in barnacles, piles of guinea pigs, and so on and so forth. The bunnies are even wearing scarves! 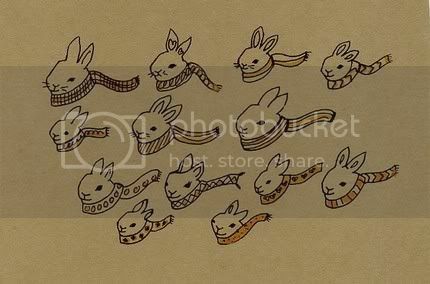 If I could get my bunnies to wear scarves, it would be a very happy day! I love these prints- they are simple but wonderful. I have a Gocco and it's so amazing and has so many wonderful capabilities that I never use it. It sits in my closet, sad and dusty, because when I pull it out I think of 1,001 things I want to make, and I get too overwhelmed and so I put it back. I am glad to see that's not the case for Elise, and I am happy to have stumbled upon her wonderful shop. She also has a blog, which you will find here.